Over the last few years there’s been renewed interest on the topic of what makes people happy (or happiness studies). “Renewed” is probably the wrong word since humans have been chasing fulfillment and happiness since we picked up traits such as language, consciousness, and the need to write things down and keep records. The interest in happiness I’m talking about is the modern kind and the type that Harvard Professor Dan Gilbert has studied in depth and popularized through books such as Stumbling on Happiness. The field of happiness studies is full of interesting fun facts like the general claim that happiness does not scale with income and that after an individual has attained certain material items (i.e., a comfortable home, adequate savings, a full belly and the prospects of keeping it full long term, et. al.) he or she doesn’t become happier with more stuff. Increased happiness, in turns out, comes by way of non material interactions and experiences. The above got me thinking about my specific happiness and how I’m most happy when I’m cooking, feeding people, and socializing. The cooking and feeding part can be complex (an elaborate dinner party with expertly picked wines) or simple (some toasted bread with tasty toppings and cold beer). Whatever the level of entertaining, it’s always the social aspect that gets me excited most. As you know we prepare most of the food we eat from scratch, but we do “cheat” on occasion and buy whole rotisserie chicken for dinner, pre-made pizza dough when we’re tired and have none in the freezer, and, more recently, well done tapenades and spreads. On the tapenades and spread side, we were lucky enough to sample a wide variety of artisan products from the company The Gracious Gourmet (based out of Connecticut). 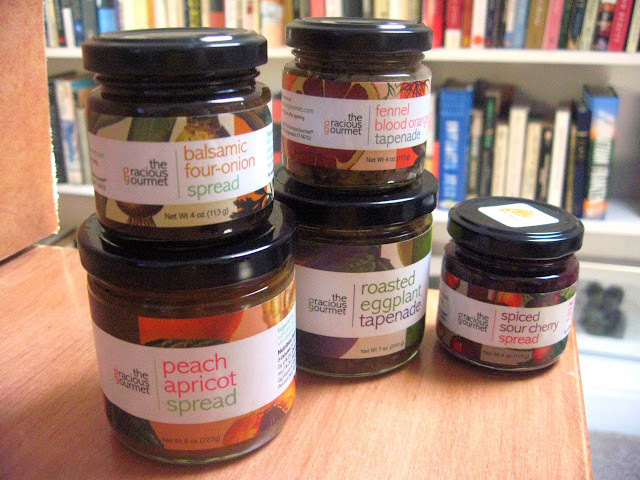 The Gracious Gourmet claims to use all natural ingredients and at last count they offer 14 unique spreads and tapenades. We sampled chile red pepper, roasted eggplant, four onion balsamic, peach apricot, fennel and blood orange, and spiced red cherry. We tasted both the spreads and tapenades on homemade bruschetta and straight up on a spoon (we did not “cook” with the products). Our favorite included the balsamic four onion (which had lots of deep onion flavor with just the right amount of sweetness derived from the vinegar), though we were a bit disappointed given the amount of ingredients in the spread including corn syrup and some hydrogenated item. 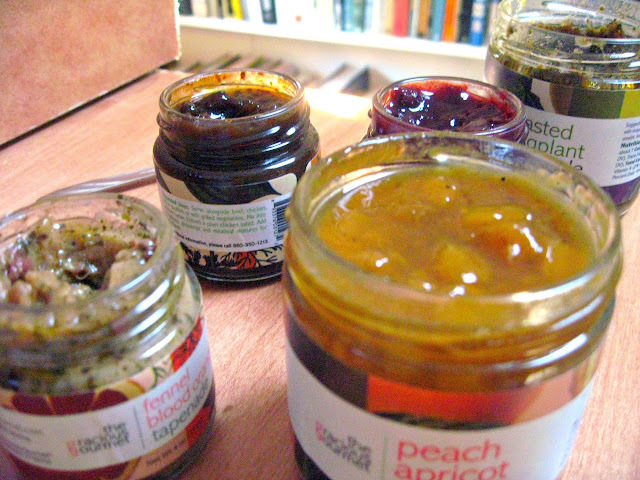 We also enjoyed the spiced red cherry and peach apricot with Greek yogurt and on British style toast with butter. 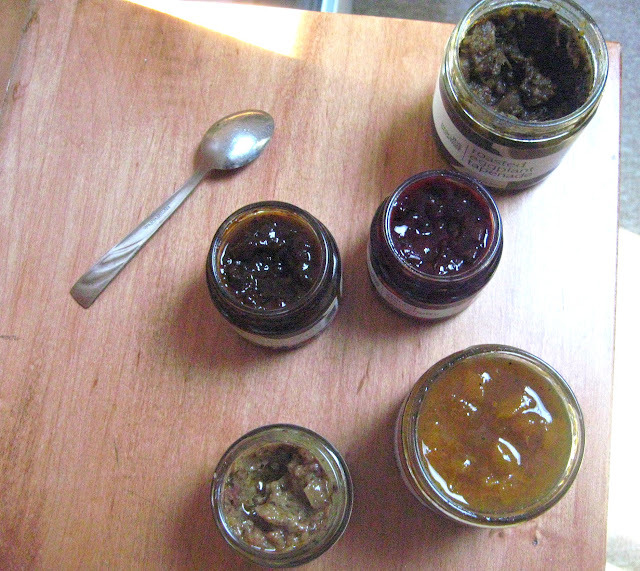 The remaining spreads and tapenades had decent flavor but they weren’t stand outs, especially disappointing was the fennel and blood orange which had very little orange or fennel flavor (as it was dominated by an olive like flavor for some reason). The roasted eggplant also had a strange rubbery consistency and the chile red pepper was probably better suited to adding to a sauce or American style beef chile). Overall, The Gracious Gourmet puts it’s heart and soul into making high quality, ready to eat, products but some of their flavors need a bit of adjusting to hit the mark (including adjustments to the amount of sugar and salt in the spreads and tapenades).